Usually, when the husband and I travel, HE reads science fiction, *I* read "chick lit" (no pun intended), and he laughs a LOT every time I cry at key moments in my books. And while I did cry a bunch on this trip TOO, it was for wayyyyy different reasons... cuz I got all... SERIOUS in my reading choices. I got all... EDUCATED - a term I now refer to as my "edumacation". First, there was Wonder Boys by Michael Chabon. And seriously, I could not have loved this book more. I loved loved LOVED IT. While it was the one to warm me up, to get me into the GROOVE that is reading five TIMES faster than the husband, and the one to let me tick a CLASSIC off my list, I have to say, it was WELL worth the time spent reading it. Two BIG thumbs up. Next, came Monster: The Autobiography of an LA Gang Member by Sanyika Shakur. How the hell I got sucked into buying this one, I DON'T know, but I blame the pretty lighting and fabulous cover reviews, cuz good LORD... While I thought this book would educate me on what gang life is really LIKE, and I thought I'd see a side of it I'll never KNOW in my life, truthfully, all I saw was a narcisstic twit trying to gloat about just how cool he is, and how he was the ARCHITECT of one of the most well-known gangs in the US. I found his language painful, his stories dreadful, and the whole thing just too much to bear. I finished the thing, but only because I kept HOPING it would get better. It didn't. Two thumbs WAY down. 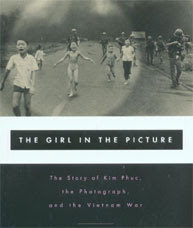 So first on the "edumacation" list comes The Girl in the Picture: The Story of Kim Phuc by Denise Chong. While I'm not normally someone who's into books about important people in history, and I worried this book would be all about how she became FAMOUS for something really quite horrible, the book actually takes some extremely SAD twists and turns, and highlights just how terrible a government can be to you in order to make THEMSELVES look good. The book admittedly starts off a little dry for the first chapter or two, but then it warms up, and the stuff Kim had to go through after ALREADY enduring a life-chang ing napalm attack, well, it'll just change your whole perspective on what human beings are capable of. Two big thumbs up. 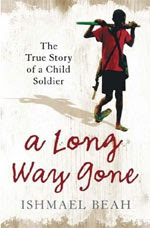 Second on the "edumacation" list is one called A Long Way Gone by Ishmael Beah. The book is the story of a boy in Sierra Leone who lives through the war but probably only does so because he succumbs to being a child soldier. He writes incredibly well, and tells a terrifying story of things you can't even IMAGINE having to do to survive - particularly at such a young age. He also tells it in ways that make you understand just how common place it can become to DO those things, and just how much you need to go through to move on AFTER you've done those things. While the Kim Phuc book was great and I definitely recommend it, this book was much better written. Two whole-hearted thumbs up. 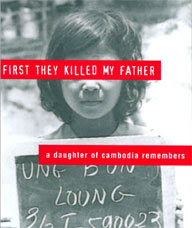 And last but not least on my list - my absolute FAVORITE book of the trip (maybe even my favorite of the last 10 YEARS of reading), is First They Killed My Father by Loung Ung. Heading to Cambodia, I knew they'd gone through that "thing" called the Khmer Rouge, and I knew there'd been some horrible atrocities, but I have to say NOW, after reading this, I was a COMPLETE and UTTERLY ignorant fool, because "horrible atrocities"? That's a softened version of what went on in that country. And while I wanna say more about how beautifully written this book is, and about how the things that happened there happened in OUR lifetime, this book is best off read for yourself. And then you should get on a plane and visit Cambodia, and you should see just how AMAZING people can be DESPITE that kind of history. And then you'll understand exactly why I'm looking into how to get adoptions from Cambodia opened back up to the US and Canada. Two very EMOTIONAL thumbs way way WAYYYYYY up. PS. I'm also now halfway through Pol Pot: Anatomy of a Nightmare. Review on that to be posted later. I loved First They Killed My Father. As much as you can love a book about genocide written from the perspective of a 5-year old girl. Thanks for these other tips. I'm going to have to get The Wonder Boys and the Girl in the Picture. I'm totally the same, it's why the vacation actually let me plow through so many books - no internet access!